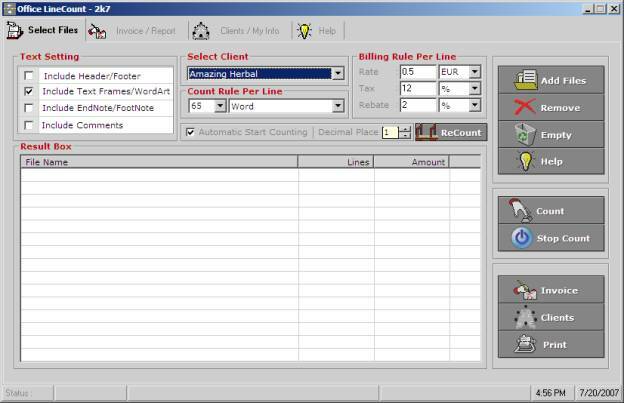 'Line Count 'N' Invoice 2007' is essential and powerful Line Count Software for Transcription Industry including Medical, Legal, Secretarial, etc. as well as Translation Industry. It has great capability to count Lines in thousands of files in a batch process within few minutes. It has document and client management system to do real life Invoicing and billing for your client. Its a complete software for Translation, Copywriting, Editing and Transcription. ...... It is fully tested on all types of Windows Operating Systems for an error-free application environment and analyzed to make it fast, accurate and User Friendly. In brief, it has all necessary tools and functionality to automate Counting, Reporting and Billing process. * Line Count Software count lines in DOC/XLS/PPT/PDF etc. files. * Line Count N Invoice counts lines/words/custom lines/chrs/pages. * Office Line Count Software supports batch process. * Line Count And Invoice Software generates Report & Invoice. * Complete Client & Document Management. Command line tool that counts the number of source code lines. Account Pro Invoice is a network-capable multi-client invoicing program. Desktop tally counter. Free. Virus and spyware free. The aim of LineIt is to earn points, as much as you can. Do you have an important deadline? Qweas is providing links to Line Count 'N' Invoice 2009 as a courtesy, and makes no representations regarding Line Count 'N' Invoice or any other applications or any information related thereto. Any questions, complaints or claims regarding this application Line Count 'N' Invoice 2009 must be directed to the appropriate software vendor. You may click the publisher link of Line Count 'N' Invoice on the top of this page to get more details about the vendor.